Excessive wear on the inside of the lower working wheel. 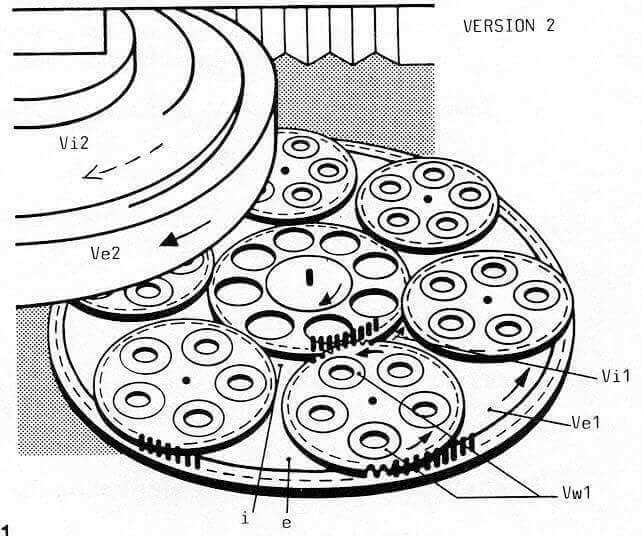 Upper working wheels adapts below. Observe change of direction in the carriers: rotation/counter-rotation. Excessive wear on the inside of the upper working wheel. Lower working wheel adapts above. Observe change of direction in the carriers: rotation/counter-rotation. Excessive wear on the outside of the upper and lower working wheels. Wheel design in the outer zone too weak, so increase outer concentration. Excessive wear in the ring of the lower working wheel. Too many parts in the center of the carriers with strong downward wear factor. Excessive wear in the ring of the upper working wheel. Too many parts in the center of the carriers with strong upward wear factor. Too frequent change of direction in the carriers. insufficient parts in the inner ring of the carriers. Excessive wear load in the ring of the upper and lower working wheels. Too many parts in the inner ring of the carriers or too little exposure. Undulations in the working wheel due to uneven arrangement, uneven hardness and so uneven wear factor on the working surfaces. a. Using an inspection straightedge, which only shows whether the working wheels is convex or concave. b. 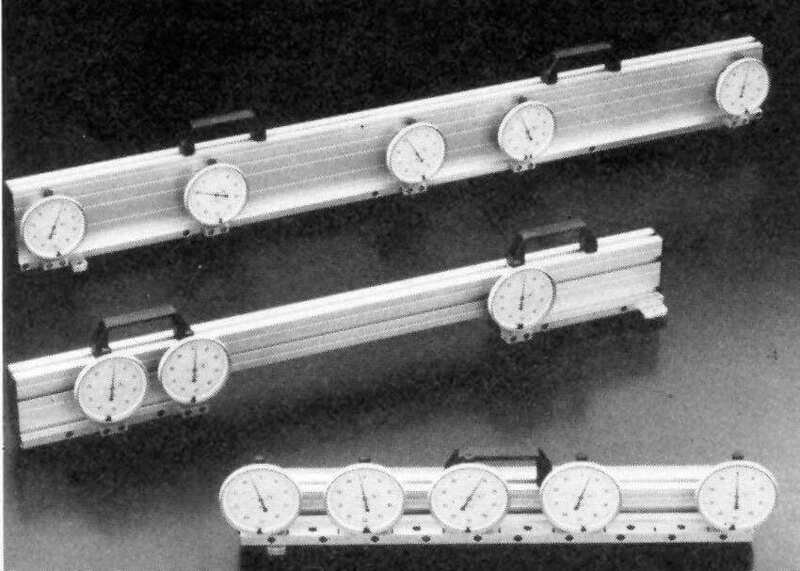 Using a precision straightedge – fitted dial gauges (figure 27). This variant displays the precise fault on the working wheel. A minimum of two measurements, each offset by 90 degrees, show the precise status of the working wheel and also possible undulations. Note: The test paths on the working wheel must be cleaned well. 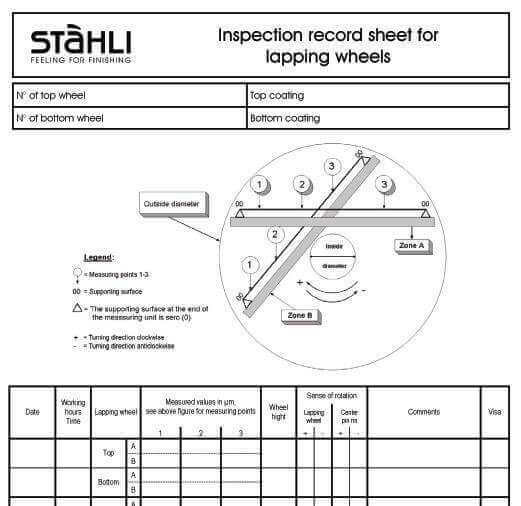 Enter the measured values in an inspection sheet (cf. Figure 28). If in doubt, repeat the procedure. In the interests of monitoring the results, it is also important to specify the settings of the machine. 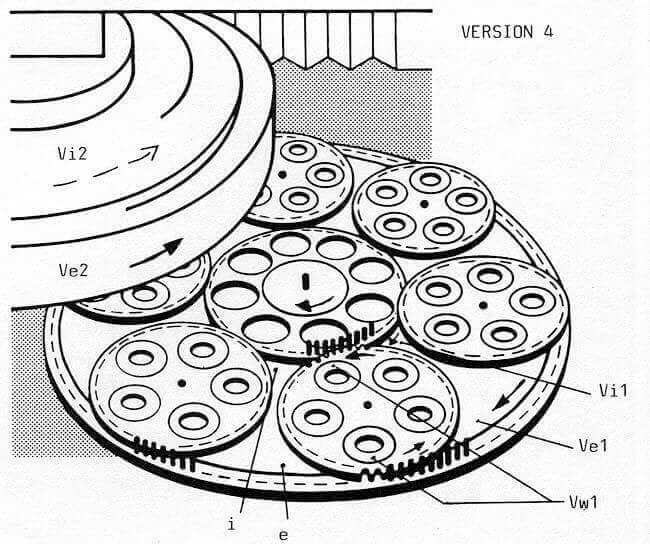 In the version with a drive for he outer pin ring and in connection with the speed of the inner and outer pin rings, it is possible to have carriers rotated very quickly or very slowly between the wheels or in their standard position! This option is referred to as the “forth way” or “fourth axis”. In this case, it is again important to note down the speed, direction of rotation and time. In the process, not the work-piece progress on the working wheel. Varying exposure curves can be produces depending on the rotation, counter-rotation and speeds. Cf. Appendix, Figure 39 Epicycoloids and hypocycloids. The text below provides basic specifications. Practical Experience has shown that the theory often does not match the values on the work pieces measured in practice and the corrections on the machine. Frequent measurements and logical thinking will help you to hamonize the theory and actual practice better. The technical values and faults of the supply to work pieces to be machined, dimensions, position and quantity per work holding plate. Designation, number and material of the working plates, hardness, surface consition, full slotted or grooved with specification of the gradient, binding, etc. Pressure and time of the three working cycles and pressure load per cm squared work surface area on the work piece. An empty column for comments. 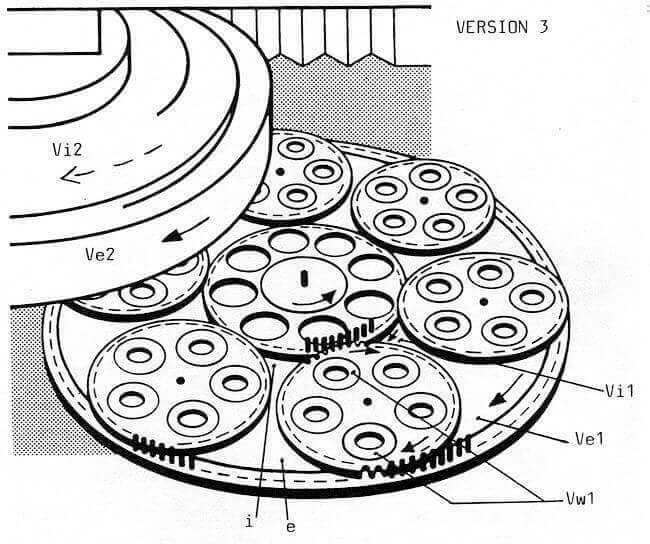 In most cases, we register a change in the working wheels after positions 1-4, 8 (figure 26). Pos. 8 is due to an excessively high positioning in the center of the carriers. The fewer work pieces we place in the center of the work holding plate, the more regular is the cutting speed between the different work pieces and the wear on the working wheel. In practice, it is necessary in the carriers and the tolerable wear. 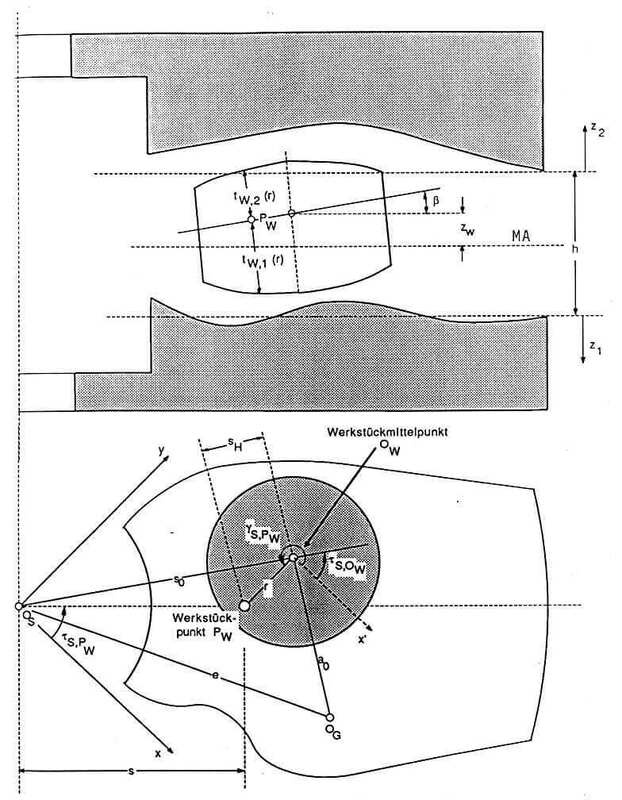 Figure 29-32 show the four versions of the possible variations in the direction of rotation and must be studied in order to avoid more serious flattness faults in good time. Enter all measuring results and procedures in the inspecition card! Reduce the speed of the upper working wheel and increase the speed of the lower, and/or change the direction of the center drive. The speed regulation of the working wheels and carriers allows you to influence the wear on the working wheels, and so to improve their flatness. During set-up, pay careful attention to the speed and direction of rotation of the working wheels, the carriers and the change times. Reduce the speed of the upper working wheel and increases that speed of the lower, and/or change the direction of rotation of the center drive. Reduce speed of the carriers and/or change the direction of rotation of the center drive. Dressing the working wheels during lapping is carried out using slotted dressing rings made of special gray cast iron that are driven by toothed gears. Dressing the working wheels during flathoning is carried out using abrasive products inserted in the cages. Flat lathing or grinding is another solution, but will probably be the most expensive. Dressing, either periodically or at the end of a working day, reduces the running times, and with optimal use, increases the service life of the working wheels. It is particularly necessary to use this procedure when the work pieces to be machined need to possess an extremely precise flatness tolerance. The quality of the flatness and the parallelism of the work pieces will remain constant if the machine is well maintained and checked regularly by the user and the speeds and directions of the rotation of the carriers and the working wheels are varied. In order to achieve this result, the user must carry out the technical measurements regularly and methodically. (cf. Figures 27, 28). The applied corrections on the machine must be tried out first before any further corrections are made. It is always advisable to consider what may be causing the fault, and then to take the necessary counter-measures in good time. The corrections must be entered regularly in the inspection card. 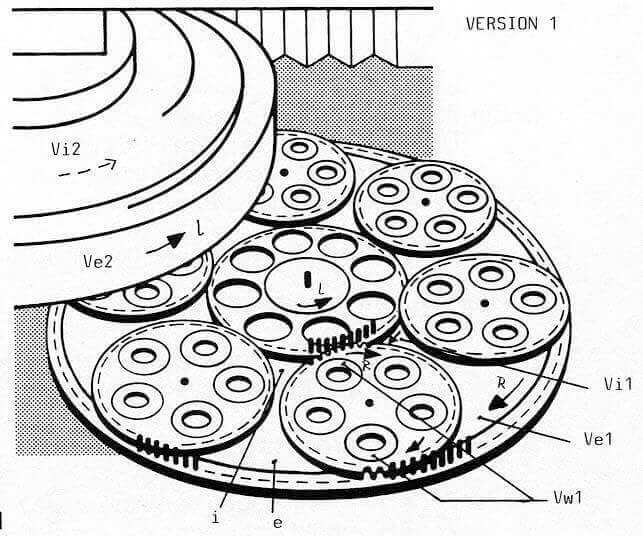 Figure 33 shows the cutting fields that the work pieces must pass through on faulty working wheels. It would be interesting to be able to determine the splitting pressure. This may range between an extremely high pressure load and lying entirely free. The lapping or liquid film will be extremely uneven, and it may even break. It is quite clear that the shortest machining time and the best quality are produced if both working wheels possess the perfect flatness.